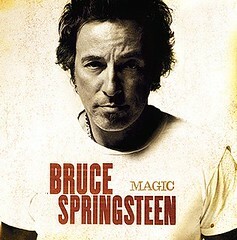 Bruce Springsteen and the E Street Band have announced their first full scale tour of the US and Europe since 2002-03, starting in Hartford, CT on October 2, the release date for the new Springsteen album ‘Magic.’ The E Street Band’s members are: Roy Bittan – keyboards; Clarence Clemons – saxophone, percussion; Danny Federici – keyboards; Nils Lofgren – guitars; Patti Scialfa – vocals, guitar; Garry Tallent – bass; Steven Van Zandt – guitars; Max Weinberg – drums. “Radio Nowhere,” the first single from Bruce Springsteen’s upcoming album ‘Magic,’ will be available exclusively and free on the iTunes Store for one week starting today. The iTunes album pre-order for ‘Magic’ also begins today and includes the free download of the “Radio Nowhere” single plus the song’s video and an exclusive digital booklet. I’m downloading the free single now, marking my calendar for October 2, and planning on getting the sitter for November 18.